Top 3 Tank Truck Safety Hazards: Do You Know The Risks? 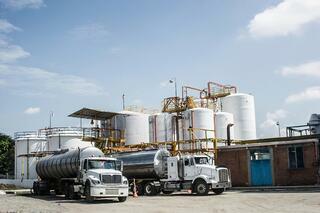 There’s no getting around it: Your throughput depends on the loading, unloading and cleaning of tank trucks. Without proper safety solutions and equipment, these tasks are incredibly dangerous for your employees and drivers. Even the most seasoned workers could experience serious injuries or even death depending on the tasks they have to accomplish, the training they’ve been through and the protection they’re provided. Do you know the risks your drivers and workers face when accessing the tops and insides of tank trucks? Learn the top three hazards they may encounter and how to protect them with the right mix of equipment and training. In most cases, accessing the tank for loading and unloading means your employee has to climb on top of the tank to open a hatch or compressed air valve. Without the proper prevention or protection, simply standing on the top of the truck puts your workers at risk for serious injuries from a fall. In 2009, a worker standing on top of a tank to unload sodium hydroxide fell from the top of the truck and fractured his femur, leading to hospitalization. It’s almost certain that this workplace injury resulted in a workers’ compensation claim, medical costs and downtime for the worker’s employer. It also attracted the attention of OSHA. This fall and the resulting injury may have been prevented if the facility had an expertly built and installed safety cage or enclosure solution designed to provide safer and easier access to the compressed air valve. Even if the worker had lost his balance, the fall protection provided by the cage would have stopped him from falling. In 2011, a tank truck driver was making a routine delivery of cleaning agents to a retail store. After accessing the top of the tank to ensure the security of the seals, he began climbing back down the side ladder. Seconds later, he fell from the ladder, hit his head and eventually died from the injury. While OSHA was never able to establish whether the driver slipped on the ladder or simply lost his balance, it’s clear that, even with the protection of the ladder, climbing on or off of a tank truck can be hazardous for drivers. This accident may have been prevented if the driver had undergone more rigorous safety training and the retail facility had invested in a fall prevention solution such as a portable tank truck access system. If you’re transporting materials, there’s a good chance those chemicals have some level of toxicity. This makes the cleaning of your tanks a dangerous task. When it comes time to clean your tank trucks, make sure your workers have been rigorously trained and are aware of the chemicals they’re working with. You should also have an emergency alert system that warns workers of imminent threats, and consider investing in a system that offers confined-space emergency entry retrieval for rescue situations. Make sure you work with a safety solutions partner able to provide confined-space entry and retrieval equipment that complies with OSHA 1910.146. Worker injuries and death aren’t just tragic – they also devastate worker morale and your bottom line. Mitigate your facility’s risk of serious injuries from tank truck safety hazards by ensuring workers are properly educated about these potential hazards. Work with a safety solutions company that helps you identify all potential hazards and provides you with equipment designed for your particular needs. Ready to learn more about comprehensive truck safety solutions? Download this industry guide from Carbis Solutions to discover strategies for a safer, more efficient workplace.